Keith Mumphery played collegiately for Michigan State and had 88 catches for 1,348 yards and seven touchdowns in 54 career games while starting at flanker. 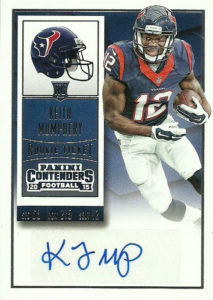 The Texans really liked Keith so they selected him in the 5th round of the 2015 draft. Originally projected as a free agent, Houston decided to select Mumphery after hearing that other teams were seriously considering him for their next selection. Primarily Keith’s strengths are character and drive based. He also is considered a sound blocker. Keith seems to always stick out in the preseason against corresponding graded talent, and has been able to make the squad against all odds for both seasons he’s been in the league. In 2015 he was counted on primarily as a return man, and had 36 punt returns for 280 yards, and 14 kick returns for 338 yards. In addition he was able to get some experience at receiver catching 14 passes for 128 yards in injury spot duty for Cecil Shorts III and Nate Washington. In 2016, Keith had 10 receptions for 69 yards buried on the receiving depth chart while the Texans go through an offensive overhaul. As the Texans are considered the most zero tolerance franchise in the NFL for player off the field issues, Keith’s time was possibly shortened by an incident from 2015 at his former Alma Mater. After the investigation was completed, the Texans cut him a few days later.